All writers have networks of people that inspire them and help them better their works. We’re so excited to have Beck Anderson, author of Fix You, on XOXO After Dark sharing her own experience with her writing group, the Chix! Today, she’s talking to us about her secret weapon for writing, retreats, amazing recipes, and delicious men. 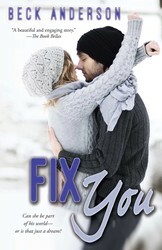 In the acknowledgements for my contemporary romance, Fix You, I thanked my writing group, the Chix. My secret weapon for writing, for friendship, heck, for surviving and enjoying life—it’s my Chix. Are you in a book club? Well, my writing group is a little bit like that. We write and critique each other’s stuff, but we also find new restaurants to try, talk about things our families do that make us crazy, and go on a mountain retreat every summer. On that retreat, there is usually a full-length piece of writing we need to read and respond to. But there are also monster cookies (find the amazing recipe here), a bucket o’ frozen adult beverages (that we once forgot and left in the freezer up at the cabin for, oh, about ten years – add them to your Walmart wedding registry here), late-night cutthroat rounds of the song game (if you don’t know that game, you’re missing out – rules here), and The List. The List. We keep and maintain a list of men. Each of us has our own section. At retreat we update the list every year. One year we each had 12 picks instead of 10 so we could make calendars. Ridiculous, I know. And too much fun. The men are movie stars, famous singers, authors, athletes–all sorts of delicious people we can never hope to meet, much less attain. All of us are married or in a relationship, anyway. Actually attaining someone on The List is so not the point of The List. The point of The List is to have fun and daydream and laugh with each other. And tease each other mercilessly. Very often one of us girls must heatedly campaign for a hot guy’s inclusion on the list. The best part are the years where some nut job (read: me) has declared a category that one of our choices must fit. Some of the more epic categories: hot news anchor, lil’ bowl of yum (I’m pretty sure only Adam Levine qualified for this category), hottest dead Irish poet (think Keats) and hottest Renaissance male statue (not even kidding). It started out as a silly little thing we did to pass the time before bed on retreat, and what I think it is now is a symbol of our friendship. Okay, it’s still ridiculous, but you get the idea. This list for me is about the six women behind it, who’ve been in a writing group for almost twenty years, who go to a mountain cabin every year, who take care of each other and lift each other up and laugh our heads off together. So you might be partial to People’s Sexiest Man Alive, or your hubby might bring home the SI Swimsuit edition, but I’ll take The List each year, hands down.